Latkes made with boiling potatoes instead of starchy baking ones, really? And with celery root, rutabagas and parsnips? You must be kidding. What would our forefather's say? "Well" I would tell them, "I still fry them in oil so I’m honoring Hanukkah. The oil just doesn't spatter all over the stove, my clothes and the floor like when making traditional latkes. Plus they are way healthier. And the good news is that they are every bit as tasty, if not tastier." You don't need to squeeze the starch out of the potatoes. Yay. You and your stove won’t be dressed in oil while making them. They hold together perfectly and are easy to turn. They can be refrigerated overnight or frozen. They reheat just as crisp and crunchy as when freshly made. Rutabaga is a root vegetable similar to a turnip, but it tastes just a little sweeter. As a member of the same Brassica genus of plants that includes other cruciferous vegetables like cauliflower, Brussels sprouts and broccoli, rutabagas have sweet, orange-yellow flesh that is best mashed, roasted, steamed or sautéed. They are high in magnesium and calcium, so they're good for bone health, and they're rich in vitamin C, which is essential for immune system function and healthy connective tissue. Plus they have fiber, magnesium, potassium, calcium, proteins, iron, and zinc. Celery root, sometimes called celeriac, would definitely win for the ugliest, gnarliest guy under the ground, but what it lacks in looks, it makes up for in flavor. It has a woodsy, celery-like flavor, but is far more concentrated and less-watery than its above-ground cousin, celery. Its mellow flavor makes it ideal to shred and cook and it’s even delicious eaten raw, like in the popular French salad called Celery Remoulade. Celery root is an excellent source of dietary fiber and potassium. It is also contains significant amounts of vitamins C and B6. It has such thick peel that you must cut it away with a knife. A vegetable peeler won’t work with this gnarly guy. So go ahead and throw away all those vitamin pills. 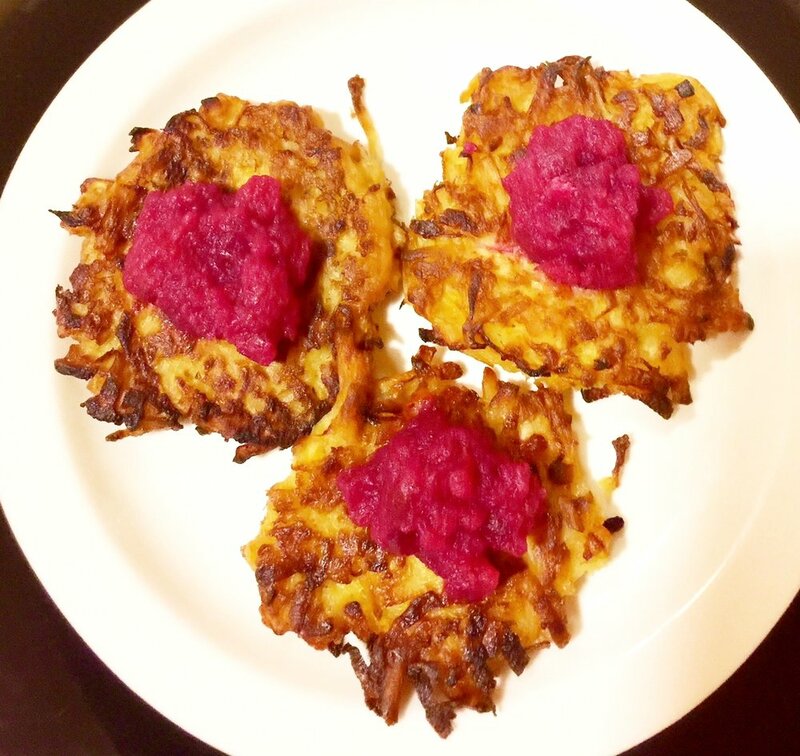 As the saying goes: A root veggie latke a day keeps the doctor away. You sure can’t say that about potato latkes. Mix veggies with beaten egg and flour. Drop 1/4 cup mounds into hot oil and flatten with the back of the measuring cup. A skimmer works great to remove those straggly shreds. 1 cup peeled and shredded rutabaga, about 1/2 pound. 1 cup peeled and shredded celery root or celeriac, about 1 medium, peeled with a knife. Beet Applesauce, for serving, click here for recipe. In a large bowl, stir together rutabaga, parsnips, celery root, potatoes and onion. Add eggs, flour and salt; mix well until thoroughly combined. In a large non-stick skillet, heat 2 tablespoons oil over medium-high heat until hot. Form patties by lightly packing the mixture into a 1/4 cup measure, drop 4 to 5 mounds of the mixture into the hot skillet. Flatten them into 3-inch rounds; flatten with the back of the measuring cup. Cook until the bottoms are deeply browned, 5 to 6 minutes. Turn and cook on the other sides, about 4 minutes or until browned. Remove to a baking sheet lined with paper towels. Remove any veggie shreds from oil left in skillet. If skillet is dry, add 1 to 2 more tablespoon(s) of oil. When hot continue making more latkes in the same manner. If serving immediately, keep each batch warm in a 300°F. oven. TO MAKE AHEAD: Latkes may be refrigerated overnight or frozen. Reheat in a single layer at 425°F for 6 to 10 minutes or until sizzling and crisp. Before serving, sprinkle with flaky salt. Serve with Beet Applesauce.